The rapper Snoop Dogg was booked on a felony charge of possession of a dangerous weapon in November 2006. 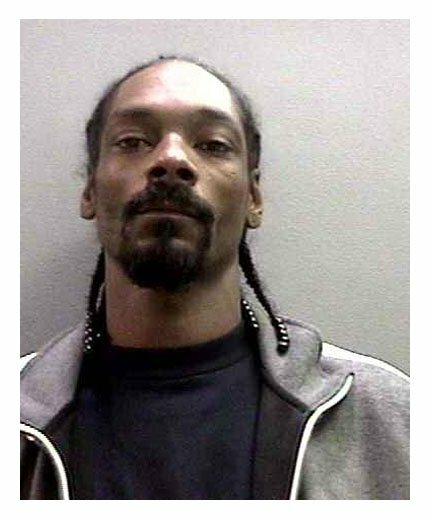 Snoop (real name: Calvin Broadus) posed for the above mug shot while being processed by the Orange County Sheriff's Department. The performer, 35, was charged in connection with an incident at John Wayne Airport during which security personnel discovered a collapsible baton in his luggage. Submitted by SpecialEd on Thu, 2011-06-02 23:24. Murder was the case that they gave me! Submitted by GeorgeDubyaBush on Mon, 2011-05-09 22:37. What they failed to mention that the baton was found in a 2 lb. pound of weed. Submitted by antiz on Mon, 2011-02-07 19:31. Well I'm sure he forgot it was there. No seriously he did. Submitted by AkCougar on Mon, 2010-08-30 10:57. Snoop Snoop Snoop......hide ur stash better man!